A studio collaboration between Guy Michael Davis and Katie Parker, Future Retrieval presents objects that merge the strengths of their studio practices by creating work that references design and is held together by craft. Ornament and detail collide with a fascination of taxidermy and natural order, and each object contains a history, reaching back and highlighting ideals of time and labor. The duo rapidly prototype three-dimensional scans and photographs, which they process in the studio and mold into porcelain to mimic the world of European decorative arts. 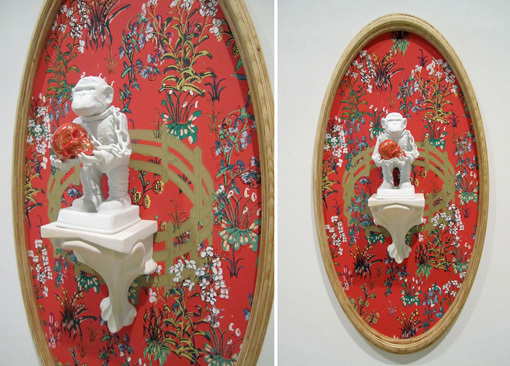 References to medieval hunting scenes and taxidermy also draw on porcelain’s rich past while churning notions of royalty/subordination and predator/prey. Inspired by German animal sculptures and cut silhouettes, Parker and Davis also use digital translation both to highlight and transform these details. Their interest in new technologies and industrial methods is that each piece is handmade, but maintains the record of a computer driven interpretation. Katie Parker earned a BFA from the Kansas City Art Institute and her MFA from Ohio State University in Columbus, OH. She has exhibited her works at venues such as the Belger Arts Center/Red Star (Kansas City, MO), the Taft Museum of Art (Cincinnati, OH) and the Clay Studio (Philadelphia, PA) and has had several residencies including at the Pottery Workshop (Jingdezhen, China), the Dresdner Porzellan Factory (Dresden, Germany) and the Belden Brick Company (Sugarcreek, OH). Parker’s work has also been covered in such media outlets as ArtForum, NPR Cincinnati, Ceramics Monthly and The Boston Globe. The artist is an assistant professor of Fine Arts in Ceramics at the University of Cincinnati. Guy Michael Davis earned his BFA from the Kansas City Art Institute and his MFA from the Ohio State University. He has exhibited his work at venues such as the Clay Studio (Philadelphia, PA), the National Museum Wales (Cardiff Wales, UK), the Javits Convention Center (New York, NY) and the BWA Gallery of Glass and Ceramics (Wroclaw, Poland). His work has been covered in Ceramics Magazine, Lucky Magazine and The Boston Globe as well as on NPR. His works are in the collections of the Cincinnati Art Museum, the Society of Dresden Porcelain Art (Dresden, Germany) and the Kansas City Art Institute. The artist is currently an annualized assistant professor of Fine Arts in Ceramics at the University of Cincinnati.